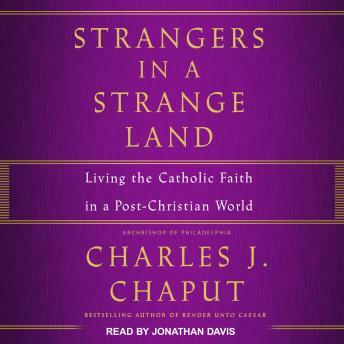 From Charles J. Chaput, author of Living the Catholic Faith and Render unto Caesar comes Strangers in a Strange Land, a fresh, urgent, and ultimately hopeful treatise on the state of Catholicism and Christianity in the United States. America today is different in kind, not just in degree, from the past. And this new reality is unlikely to be reversed. The reasons include, but aren't limited to, economic changes that widen the gulf between rich and poor; problems in the content and execution of the education system; the decline of traditional religious belief among young people; the shift from organized religion among adults to unbelief or individualized spiritualities; changes in legal theory and erosion in respect for civil and natural law; significant demographic shifts; profound new patterns in sexual behavior and identity; the growth of federal power and its disregard for religious rights; the growing isolation and elitism of the leadership classes; and the decline of a sustaining sense of family and community.